Thu., Feb. 15, 2018, 8:17 p.m.
LOS ANGELES – The guy who grew up 40 miles away, first played Riviera as a teenager and was out of golf with a bad back returned Thursday and shared the lead at the Genesis Open. Woods, who grew up in Cypress and made his PGA Tour debut at Riviera when he was 16, played this event for the first time in 12 years. He lost a tee shot in a eucalyptus tree and made double bogey as part of a rugged start, and then settled in with a series of key putts for a 72. Finau started with four birdies in five holes and finished with one last birdie for his 66. An unusually large crowd for Thursday at Riviera was out early to watch Woods, with fans standing six-deep around some of the greens. There still were not enough people to help locate his tee shot on the par-5 11th hole, presumably swallowed up by the tree. Woods is playing Riviera for the ninth time as a pro, the most of any PGA Tour course without ever winning. His expectations are tempered now at age 42 and returning from his fourth back surgery. His game isn’t sharp, though it’s moving in the right direction. He made five birdies despite hitting only seven greens in regulation, and he recovered from being 2 over after three holes. Cantlay played with Jordan Spieth (71) and fellow UCLA alum Kevin Chappell (69), and as they finished in the twilight, the crowd had thinned considerably. They missed a clean round by Cantlay, whose only bogey came on the par-3 fourth hole when he came up short of the green and missed a 10-foot putt. Otherwise, he was smart, simple and confident. 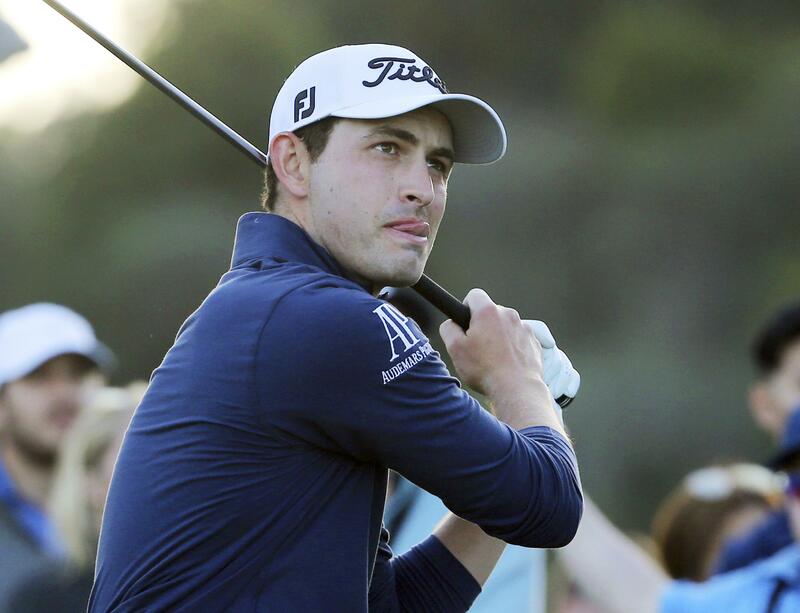 “I’m pretty familiar with the golf course, and you’ve just got to hit a lot of smart shots over and over and over again, and not get too greedy,” Cantlay said. He can’t remember how many rounds he has played at Riviera. The Bruins typically played at Bel-Air on Tuesday and Thursday, and Riviera about once a month. Cantlay smiled walking off the green. Defending champion Dustin Johnson got off to a rough start, particularly on No. 5. He played his third shot from ankle-high grass and it flew over the green. His chip came back down the slope and the world’s No. 1 player walked off with a triple bogey. Johnson wound up with a 74. Sam Saunders, who last year started with a 64, was among three players at 67. Bubba Watson was in the group at 68. Twelve players did not finish the round before darkness. Woods played with Justin Thomas (69) and Rory McIlroy (71). They had the largest gallery of the day, most of them to see Woods, who had not played at Riviera since 2006. It was never hard to figure out where Woods was on the golf course, and that was particularly true for Saunders. He was teeing off on the par-3 fourth when he looked down the hill at Woods playing the 18th. Saunders knows all about the energy one player can bring to a tournament. He heard plenty of stories about his grandfather, Arnold Palmer, who first brought the masses to golf more than a half-century ago. Published: Feb. 15, 2018, 8:17 p.m.